The kidney is a bean -shaped organ located on the either side of the body beneath your rib cage. The most common function associated with kidney is the production of urine. The other important function which is done by the kidney include retaining salt and water, regulation of blood pressure, stimulates the bone marrow to produce red blood cells and also in the calcium and phosphorus metabolism. The main functional unit of the kidney is a nephron. Kidney has about more than 1 million nephron each. Kidney cancers also are most commonly seen in order individuals. There are many types of cancer that can affect the kidney. The most common variant of kidney cancer is the clear type renal cell carcinoma (RCC) which is seen in more than 80% of individuals. Other tumours which can involve the kidney include transitional cell carcinoma, Wilms tumour (kidney cancer that affects children), metastasis from other tumours, lymphoma etc. Most times the tumour is found incidentally then being screened for other condition. Some individuals come with complains of having painless haematuria (blood in the urine). There might be also be a swelling or a lump on the side of the kidney and sometimes persistent dull aching pain in case the tumour is very large. Other symptoms include a general sense of feeling unwell, left testicular swelling in men (this is due to the tumour blocking the testicular vein which is draining into the left renal vein), anaemia (this could be due to bleeding from the tumour). There are various modality is by which this condition can be diagnosed. The most common one include an ultrasound scan which can detect the change in size of the kidney. Your physician might also perform some tests to confirm the diagnosis and might require you to perform a CT scan intravenous contrast. This will help in the management and planning of treatment. 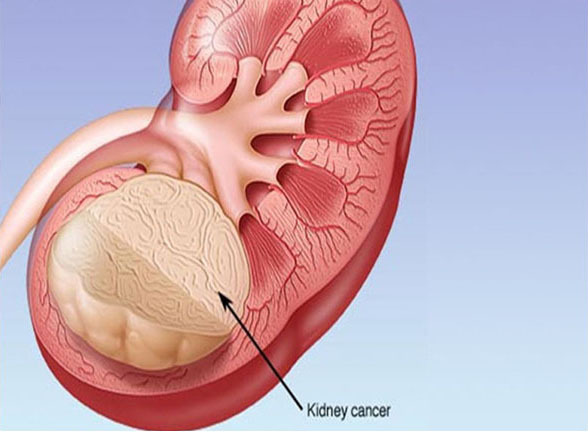 Treatment for kidney cancer depends on the site of the tumour in the kidney, size of the tumour and spread of the tumour. The list of treatment options will be discussed depending on the tumour by your doctor prior to embarking on it. Your doctor will recommend you the best treatment option after reviewing your blood results and CT scan results. There might be a need to perform other tests prior to proceeding with the surgery.